Take a look at this album cover. You got Ace sitting at the bottom of the stoop, pen and notebook in hand (looking up at the heavens), all the while rocking a nice all white Velour outfit, complete with the classic Kangol. That's quite the symbolic statement if you ask me, which leads up into this album. 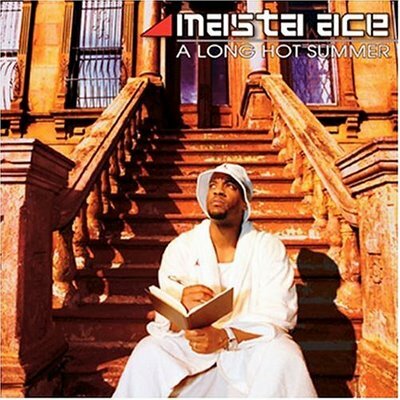 After 2001's critically acclaimed and HUGELY slept on "Disposable Arts", Ace returned in 2004 with another concept album (which would become his theme beginning with Disposable Arts), and this time around Ace documents his "long hot summer" in Brooklyn, with unofficial manager Fats Belvedere. The intro sees Mr. Belvedere counting money for Ace in a hotel room. It leaves you wondering just what the hell is going on, and Ace addresses this as we head into the first track. A funny "promotional spot" of sorts from Mr. Belvedere. Another funny skit here, with Mr. Belvedere talking with Ace while he sits on the stoop, pen and pad in hand of course, working on "Beautiful". Mr. Belvedere even brings Lisa back up from "Disposable Arts", lol. He then invites Ace to his crib, as he has some sort of an idea he wants to share. The "idea" that was mentioned in the previous interlude was hinted at here, but it ends with Ace going to the store, lol. Stay tuned, lol. We finally get to Fats' idea, in which he proposes that he becomes Ace's road manager on his next tour. Fats almost shoots someone who he claims is trying to sneak off without paying. That turned out to be false, lol. Fats almost loses it on this interlude, until Ace steps in (again) and saves the day, lol. We then find out that "the room service" from the intro wasn't who they claimed, as they were the Feds. Ace is then jailed for his troubles. And in true Ace fashion, he has a plan once he's released. Outtakes from the album, which was probably a first. This is another excellent concept album, fast paced and easy to listen to like "Disposable Arts". It's not better, but that doesn't hurt the quality at all. Ace continues to shine and get better, always having something to talk about and do an effective job at doing so. He would go on another hiatus from hip hop after this album, as he would later hook up with Punchline, Strick, and Wordsworth in 2008 to form the awesome supergroup eMC and release the 5 star classic "The Show". I dissected that album, which you can check out here:(http://mayepov.blogspot.com/2012/10/emc-show.html). "A Long Hot Summer" gets a solid 4.5 star rating from me. Well done.